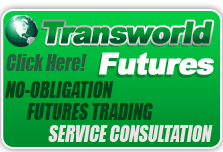 We, at TransWorld Futures, LLC., value our relationship with each of our customers, and we appreciate the trust that you have placed in us. We recognize that you have concerns about the confidential personal information we obtain about you throughout our relationship. Because protecting your confidential information we obtain about you is used and maintained. We pledge to protect that information and ensure that it remains private. The information in this notice summarizes the categories of personal information that we collect about you, how that information is handled, and how we protect that information. We do not disclose any nonpublic information about our customers to anyone, except as required or permitted by law. TransWorld Futures does not sell personal information obtained about you to companies that are not associated with TransWorld Futures for the purpose of marketing their products or services to you. Information we receive from you on account applications or other forms, such as name, address, federal tax identification number, income, assets, and similar information. We use this information to administer the accounts we maintain on your behalf, process transactions requested by you, respond to your inquires, evaluate your investment needs, and identify other products and services that may interest you. Information about your transactions with us or our affiliates, such as your account balance, transaction history and payment activity. This is used to process transactions you request and ensure the accuracy of the records and reports we maintain that relate to your account. We may also collect various other types of data, such as transaction, site navigation and optional survey information, in connection with your use of online services we make available to you, either directly or through other entities. We use this information in order to improve the quality of the services we offer you. Information we receive from consumer reporting agencies, such as credit relationships and credit history. We use this information to help determine your eligibility for TransWorld Futures products and services, collect or report debts owed to us, and protect our rights and property. The information we collect relating to your transactions and experiences with TWF or any affiliate may be shared among TWF's affiliates. We may also share some or all of the information we receive about you from consumer reporting agencies, such as credit information. Companies that are the source or origin of financial servies offered by TWF, such as banks, securities broker-dealers, mutual fund companies and insurance companies. Nonfinancial companies, such as companies that perform services on our behalf, e.g., check printers, quote vendors, companies that prepare account statements for us, companies that assist us in communicating or marketing our services. Others, such as independent contractors or technical system consultants who program our software, government agencies and regulators, consumer reporting agencies, and other outside entities as permitted or required by applicable laws. All TWF Associated persons are instructed to use strict standards of care regarding the confidentiality of your nonpublic personal information as outlined in firm policies. Associated persons not adhering to our firm policies are subject to disciplinary action. We require outside companies and independent contractors to whom we provide customer information for marketing, servicing or processing to enter into a confidentiality agreement that restricts the use of the information to those purposes. We maintain physical, electronic and procedural safeguards that comply with applicable laws to protect your nonpublic personal information. There is a substantial risk of loss in trading commodity futures and options on futures. Only risk capital should be used when trading futures or options. Investors could lose more than their initial investment. The lower the Day Trade Margin the higher the leverage and riskier the trade. Leverage can work for you as well as against you, it magnifies gains as well as losses. You should consider carefully whether futures or options are appropriate to your financial situation. Past performance is not indicative of future results. If the market moves against your position or margin levels are increased, you may be called upon to pay substantial additional funds on short notice to maintain your position. If you fail to comply with a request for additional funds within the time prescribed, your position may be liquidated at a loss and you will be liable for any resulting deficit.